A tsunami [soo-nah´-mee] is a series of huge, destructive waves caused by an undersea disturbance from an earthquake, volcano, landslide, or even a meteorite. As the waves approach the shallow coastal waters, they appear normal and the speed decreases. Then, as the tsunami nears the coastline, it turns into a gigantic, forceful wall of water that smashes into the shore with speeds exceeding 600 miles per hour (965 km/h)! Usually tsunamis are about 20 feet (6 m) high, but extreme ones can get as high as 100 feet (30 m) or more! a tsunami is not a tidal wave – it has nothing to do with the tide?! another name used to describe a tsunami is “harbor wave”?! “tsu” means harbor and “nami” means wave in Japanese?! sometimes the ocean floor is exposed near the shore since a tsunami can cause the water to recede or move back before slamming in to shore?! 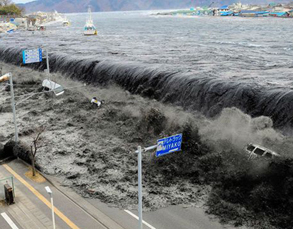 tsunamis can travel up streams and rivers that lead to the ocean?! 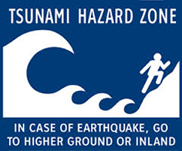 Tsunami Preparedness Week is held in March and is designed to help cities, towns, counties, universities and other large sites in coastal areas reduce the potential for disastrous tsunami-related consequences using National Weather Service’s TsunamiReady program. Their site contains resources that can help families and communities year-round, plus we wanted to share some tsunami safety tips from our IT’S A DISASTER! book. Make a plan – Develop a Family Emergency Plan (e.g. establish meeting places, list of emergency contact #s, out of state contact person, etc) and Disaster Supplies Kits. In port – May not have time to get out of port or harbor and out to sea – check with authorities to see what you should do. Smaller boats may want to dock and get passengers and crew to land quickly. In open ocean – DO NOT return to port if a tsunami warning has been issued since wave action is barely noticeable in the open ocean! Stay out in open sea or ocean until authorities advise danger has passed. RED or GREEN sign in window – After a disaster, Volunteers and Emergency Service personnel may go door-to-door to check on people. By placing a sign in your window that faces the street near the door, you can let them know if you need them to STOP HERE or MOVE ON. Either use a piece of RED or GREEN construction paper or draw a big RED or GREEN “X” (using a crayon or marker) on a piece of paper and tape it in the window. Throw out moldy items that are porous (like rotten wood, carpet padding, furniture, etc.) if they’re too difficult to clean and remove mold. Remove standing water and scrub moldy surfaces with non-ammonia soap or detergent, or a commercial cleaner, rinse with clean water and dry completely. Then use a mixture of 1 part bleach to 10 parts clean water to wipe down surfaces or items, rinse and dry. Above from IT’S A DISASTER! …and what are YOU gonna do about it? book … and find some additional resources below the video. You are currently browsing the archives for the tsunami category.